So many estates are heavily laden with table top accoutrements, including table linens, fine china, silver, and crystal. At the end of sales, most of these items remain to be sent to an auction house. 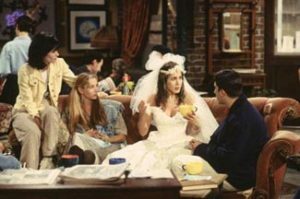 I attribute the change in market to the hit show “Friends.” Specifically to the pilot episode, “The One Where Monica Gets a Roommate.” You remember the scene, Ross says, “I don't want to be single, okay? I just... I just- I just wanna be married again!” Enter Rachel, frantic and in a wedding gown. 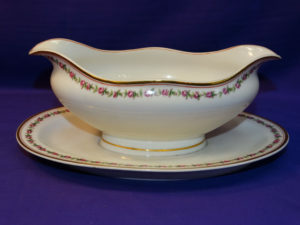 Instantly, we realize that Rachel trades the Limoges gravy boat, a metaphor for her mother’s life, father’s expectations, and all the things she should want, for an opportunity to be independent, single and live life on her terms. Her terms come with purple walls, mismatched chairs, eclectic décor and an enviable simpler lifestyle. A trend begins – toss the gravy boat! And, because trends are an evolution, a process… Rachel tosses her Limoges gravy boat in 1994 and a new table top trend begins by 2001. A category called “casual Luxury” emerged. Suddenly the billion-dollar fine china industry in 2001 dwindles to a mere $345 million by 2005. Today, it is nearly impossible to give fine china away. Sure, industry analysists will say it is because of a busier lifestyle, or attribute it to more casual living, a preference for dishwasher friendly dinnerware, but I think it is because in 1994, on TV, Rachel Green walked into Central Perk and said she was more turned on by a gravy boat than by the man she left at the altar.